We can’t believe that the long dreaded badger cull is set to start next Monday 26 August. 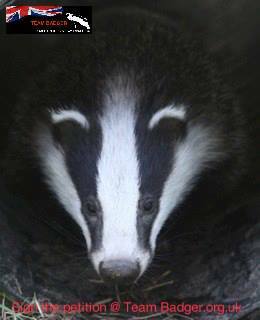 5000 badgers risk being shot as a sop to the National Farmers Union and as an easy scapegoat for Bovine TB – while the farming industry refuses to look at its own practices to see the real cause of the problem. We are lucky in Wales that after a lot of campaigning and a change in the political make-up of the Welsh Assembly Government, a cull was finally ruled out and a programme of vaccination has been started. It must be said that although the Tories and their Lib Dem friends were much in favour of a cull in Wales (as in England), Plaid Cymru that likes to present itself as modern, progressive party, seemed almost obsessed with getting a cull underway. These things shouldn’t be forgotten about when next we have a chance to vote and we can only hope the news from England is not as grim as feared come next Tuesday morning.